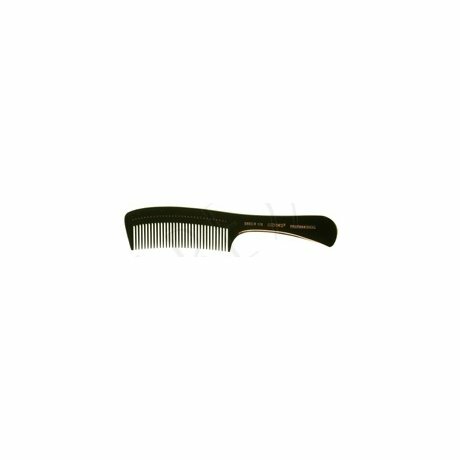 100 % Hard Rubber CombHandle comb.21,4 cm. A high-end line of combs from New York Hamburger, one of the world leading comb manufacturers. They are made from vulkanized natural rubber(ebonite) and go through a staggering 24 steps in production from a solid block of rubber to a finished comb. Matador combs with their cone-shaped, finely polished and rounded pins glide softly through the hair, no tangling or knotting, no damage to hair. Like in the past, the comb pins are formed in an elaborative, largely manual process through sawing with diamond cutters. The material is also very resistant to heat, discoloration and acids.